With a reputation for simple and elegant architecture, Michaelis Boyd is a design-led practice with a broad ranging, luxurious portfolio. Based in London, the practice’s latest project focused on the interiors for internationally renowned Cantonese restaurant, Duddell’s. Originally founded in Hong Kong in 2013, Duddell’s is known as the premium destination for classic and authentic Cantonese cuisine; the latest restaurant, Duddell’s London, is situated in the heart of London Bridge, in the historic St. Thomas’ Church. A historic Grade II listed building, St Thomas' Church is a setting that - as well as offering guests an amazing dining experience – represents one of the finest examples of Queen Anne architecture in London. 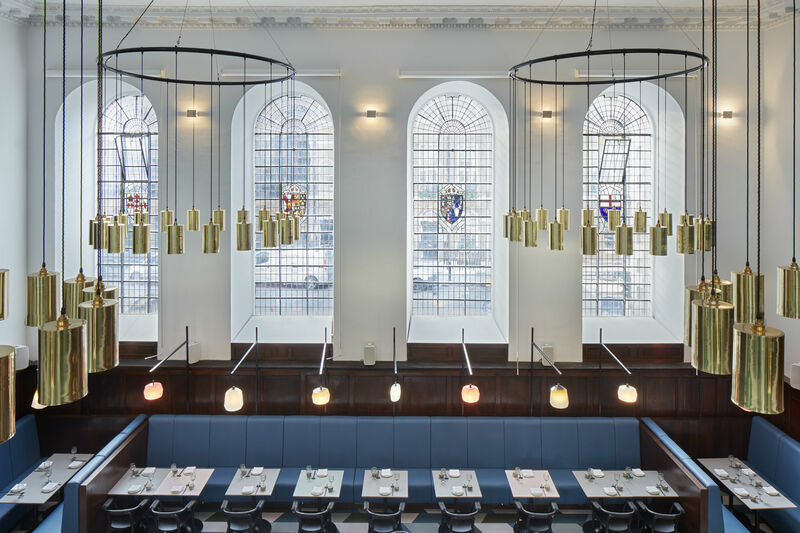 The team at Michaelis Boyd oversaw the restoration of the church to transform it into the restaurant venue. The renovation included carefully configuring the design to make sure it upheld the long history, and rich heritage, of the church building. 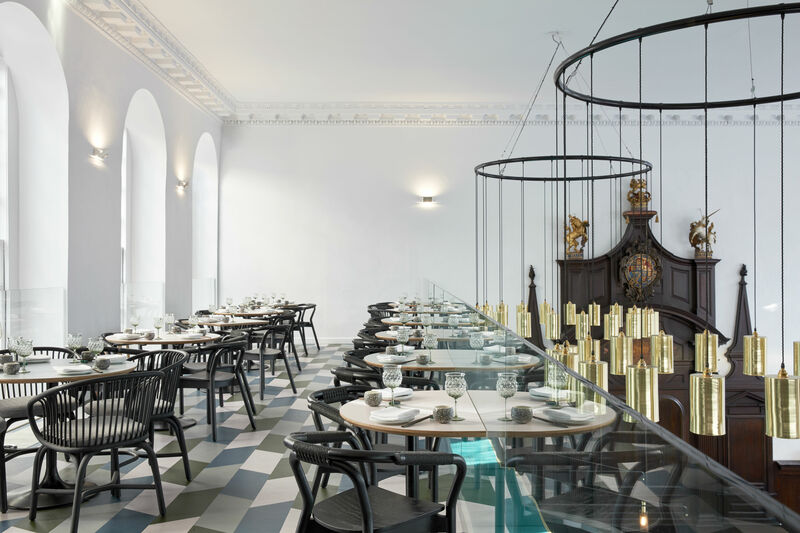 The newer elements that have been added to the interior, including the dim sum kitchen and bar, were designed as free-standing structures that are detached from the walls to conserve the historic location. Set over two floors, the design for Duddell’s was inspired by traditional 1960’s Hong Kong tea restaurants, and makes use of colours and patterns to give a contemporary twist to the retro look. Downstairs, the ground floor has been designed to focus on the original dark timber of the church altar. In contrast, the mezzanine level above gives diners views – through a clear glass balustrade – across the open kitchen and the expansive, eight-metre high space. 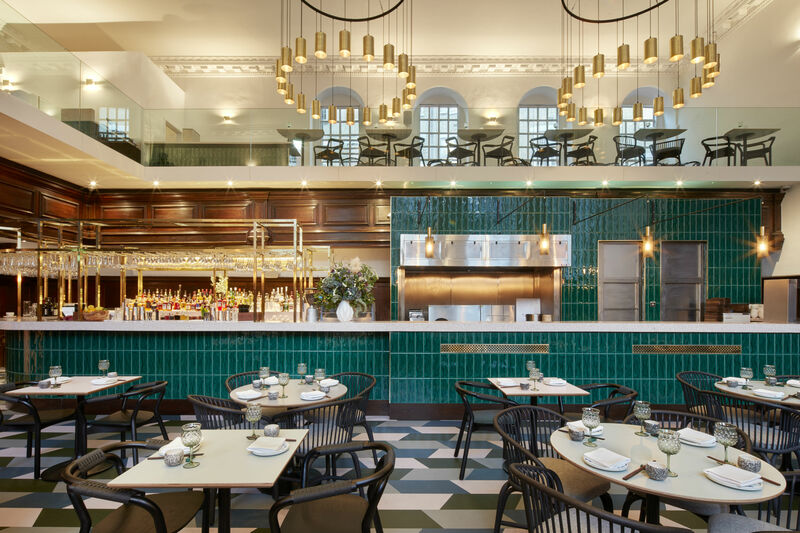 A dramatic central island, clad in bold green tiles, spans the ground floor as the centrepiece of the restaurant. The monolithic structure acts as both the restaurant cocktail bar and the open dim sum kitchen, allowing diners to watch their food. To contrast, the island’s work top is made from pink terrazzo with white chips; the bar has been decorated with brass shelving and built-in illumination. Under diners’ feet, the vibrantly coloured, geometric floor works as another contrast to the existing dark oak cladding of the church, with lines the restaurant’s perimeter. The huge, four-metre high arching windows provide plenty of natural light during the day, and are complimented by a deep blue leather banquette. In other areas of the restaurant, a mix of black rattan and timber chairs have been paired with an array of tables with colourful laminate table tops. The mezzanine level above wraps around two sides of the restaurant, and Michaelis Boyd has also installed modern chandeliers into the original ceiling; these have been connected with lightweight fixings to make sure they have minimal impact on the original structure. The first international outpost of the restaurant, Duddell’s London is a cultural and social destination that showcases the origins of Cantonese cuisine, within an equally impressive setting.